The system allows you to see exactly which suppliers are contributing how much to the local economy. You can use this to improve your supplier performance and to prove the value of your activity. All our clients are able to see whether SMEs, PLC's, or the non profit sector really contribute the most to the local economy. Now for the first time you can use new mapping facilities to enable any organisation, anywhere in the world to use LM3. All you need to know is who your suppliers are and how much you paid them. What could be easier. Now completely redeveloped to show for the first time not only your average LM3 but also the difference that using local or non-local suppliers makes to the local economy. This makes LM3 the key tool in delivering both coherent Corporate Social Responsibility programmes and sustainability measurement. LM3 Live has now been released! Whatever your reason for measuring your local economic impact, LM3 Online is the fastest, most user-friendly, and most cost-efficient method available. Now completely redeveloped to show for the first time not only your average LM3 but also the difference that using local or non-local suppliers makes to the local economy. This makes LM3 the key tool in delivering both coherent Corporate Social Responsibility programmes and Sustainability Measurement. The new model now also works anywhere in the world making it available for all forms of international grant aid impact, and global Corporate Social Responsibility uses. Round 1 - Any organisation’s turnover or project cost including procurement and employee wages and other forms of cost. Round 2 - Where and with whom the company spends that money. Round 3 - Where and how suppliers and employees re-spend their incomes. The multiplier is then calculated for every unit of currency spent within a ‘local’ area selected by the user. For example, an LM3 score of 1.50 would indicate that every $1 earned by your company generates an additional $0.50 for your local area. LM3 has been applied in the UK public sector at local government levels, and been used to demonstrate the local economic impact of over £13 billion of public, private, and not for profit spending. LM3 Online enables any organisation to measure its economic impact by analysing any expenditure on any geographic area using current data. LM3 Online automates the whole process. 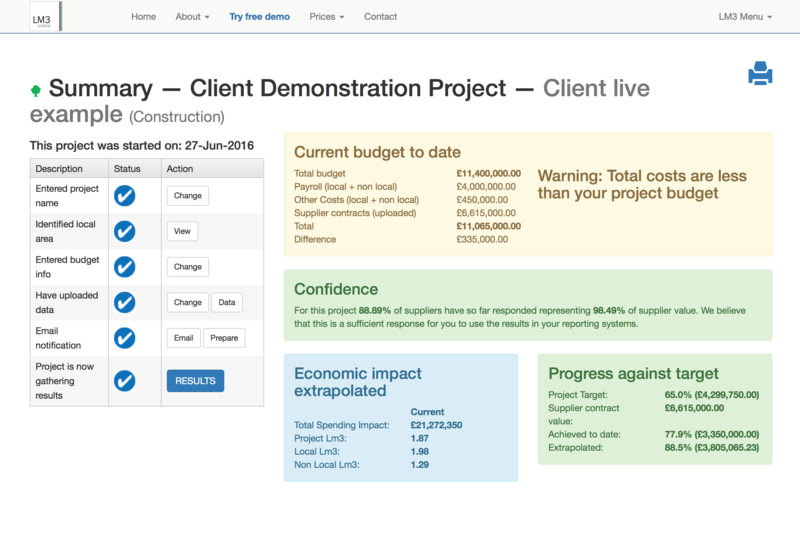 Simply upload the spending data of the budget you wish to measure, such as a contract or company turnover; specify the target local area, and the system does all the surveying and calculations. The private sector - To demonstrate added value of contract work and local benefit and to deliver auditable Corporate Social Responsibility (CSR).